Well, I have had my 47 gallon tall tank for 12+ years. It has gone through a lot over those years. Now, I am at a point where I want to refresh the tank. It has bubble algae that is driving me nuts from time to time along with cyano. 1. 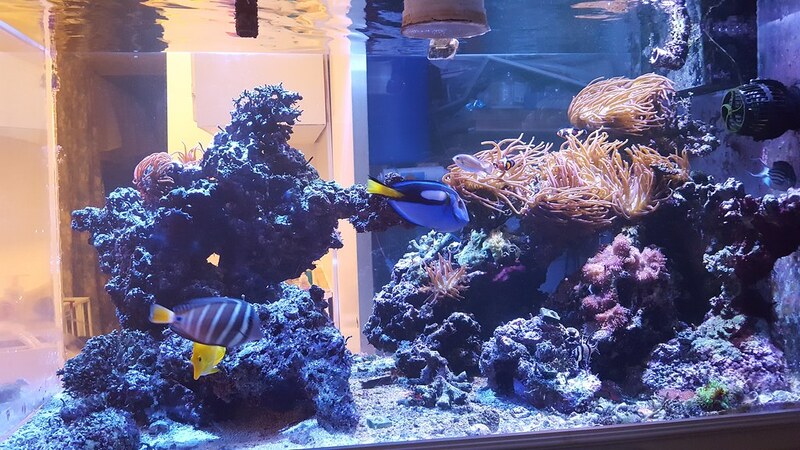 What I am looking at doing is reducing the amount of LR in the tank since there is a lot, but I am also planning on pulling out the rock to clean off all gunk (including bubble algae). I was first thinking I could use fresh water to spray off some stuff, but that seems like it will do to much harm. I'll just use saltwater bins to do that. 2. Since the sand is rather old and probably has a ton of build up, I thought I would also replace the sand. Is this a good idea or should I just let it be and do some cleanup of the surface of the sand? I would be doing this after the LR has been removed so as to get all the spaces. 3. Remove my protein skimmer as it did not seem to make much of a difference on the nutrient export, and use macro algae with the Kessel H380 in my sump. Just looking for some feedback on my thoughts here. 12+ years! Rich, that's amazing. I'd highly consider draining the tank, removing the sand, putting in new sand, and refilling the tank... all in one afternoon. You can freshen it up with new aquascape and design. Any thoughts on using the Kessel H380 to grow macro in my sump? It has really good reviews in this regard, just not sure that 300.00 is a good investment on this or not. H380 is amazing at growing Macro. Might be overkill for a sump on a 48 gallon unless you have a dedicated Fuge. All of my fun stuff arrived today, so tomorrow is the day! Wish me luck! Oh, and I need to get some chaeto for my sump. Does anyone have some that I can either have or pay for? I finished it up yesterday. That was a major project, but it looks much better. I will be placing all of the coral and fish back in the tank today. I did not take any pictures of the process. I started at 8am and finished up around 6pm. Most of my time was spent waiting on saltwater and additional cleanup. The tear down started at 1pm. I was able to recover 90% of the water from the tank using 2 large storage bins. I mixed 20 gallons which was used to clean the live rock. I added 10 gallons of fresh saltwater to the tank, and I'll do a 10 gallon water change today prior to adding back the livestock. 1 You always need more saltwater than you think. Also, have it all ready before you start. 2 Use a wet dry vacuum to get out the last of the sand or water. 3 Make sure to have extra storage bins to hold live stock and tank water. 4 Be willing to accept it will be messy, but worth it. 5 Realize it will take longer than expected. Amen to needing more saltwater than you think and taking longer than you think. 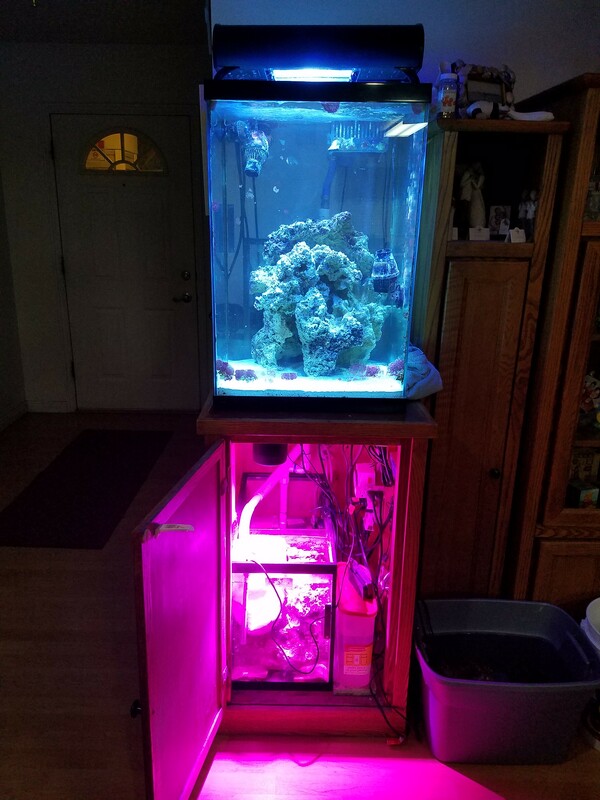 I have moved a 72 gallon, a 90 gallon, and a 150 gallon twice. There have been too many times that I go to bed at 3am because I had to get life support up and running on a moved fish tank. I am glad it has gone well so far.